Millipred Tablets contain the following inactive ingredients: anhydrous lactose, colloidal silicon dioxide, crospovidone, D&C Yellow No. 10, docusate sodium, FD&C Yellow No. 6, magnesium stearate and sodium benzoate. Naturally occurring glucocorticoids (hydrocortisone and cortisone), which also have salt-retaining properties, are used as replacement therapy in adrenocortical deficiency states. 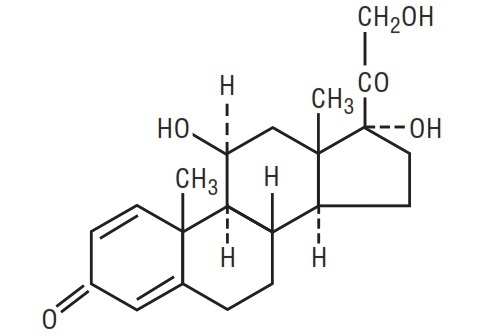 Prednisolone is primarily used for its potent anti-inflammatory effects in disorders of many organ systems. 1. Endocrine disorders. Primary or secondary adrenocortical insufficiency (hydrocortisone or cortisone is the first choice; synthetic analogs may be used in conjunction with mineralocorticoids where applicable; in infancy mineralocorticoid supplementation is of particular importance). 10. Edematous states. To induce a diuresis or remission of proteinuria in the nephrotic syndrome, without uremia, of the idiopathic type or that due to lupus erythematosus. In patients on corticosteroid therapy subjected to unusual stress increased dosage of rapidly acting corticosteroids before, during, and after the stressful situation is indicated. Average and large doses of hydrocortisone or cortisone can cause elevation of blood pressure, salt and water retention, and increased excretion of potassium. These effects are less likely to occur with synthetic derivatives except when used in large doses. Dietary salt restriction and potassium supplementation may be necessary. All corticosteroids increase calcium excretion. Steroids should be used with caution in nonspecific ulcerative colitis, if there is a probability of impending perforation, abscess or other pyogenic infection; diverticulitis; fresh intestinal anastomoses; active or latent peptic ulcer; renal insufficiency; hypertension; osteoporosis and myasthenia gravis. Sodium retention. Fluid retention. Congestive heart failure in susceptible patients. Potassium loss. Hypokalemic alkalosis. Muscle weakness. Steroid myopathy. Loss of muscle mass. Osteoporosis. Vertebral compression fractures. Aseptic necrosis of femoral and humeral heads. Pathologic fracture of long bones. Peptic ulcer with possible perforation and hemorrhage. Pancreatitis. Abdominal distention. Ulcerative esophagitis. Impaired wound healing. Thin fragile skin. Petechiae and ecchymoses. Facial erythema. Increased sweating. May suppress reactions to skin tests. Convulsions. Increased intracranial pressure with papilledema (pseudotumor cerebri) usually after treatment. Vertigo. Headache. Menstrual irregularities. Development of Cushingoid state. Suppression of growth in children. Secondary adrenocortical and pituitary unresponsiveness, particularly in times of stress, as in trauma, surgery, or illness. Decreased carbohydrate tolerance. Manifestations of latent diabetes mellitus. Increased requirements for insulin or oral hypoglycemic agents in diabetics. Posterior subcapsular cataracts. Increased intraocular pressure. Glaucoma. Exophthalmos. Millipred Tablets (prednisolone tablets USP, 5 mg) are scored, round, peach tablets imprinted DAN DAN 5059 supplied in bottles of 100 (NDC 23594-505-01). Dispense in a well-closed container with child-resistant closure. Dosage: See package insert for dosage and full prescribing information.